The Monopoly Nerd's Blog! 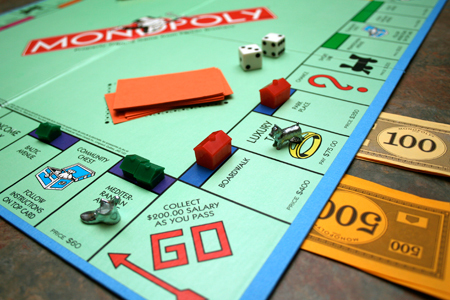 | The strategies, tactics, and math behind Monopoly. Welcome one and all to the Monopoly nerd’s humble (and virtual) abode. If you have stumbled upon this blog because you have questions about the Monopoly board game, then you are certainly in the right place. Odds are that you will either find — or I will provide to you via comments — every answer that you seek. As mentioned in my first post and in my profile, I am a lover of math, probability, game theory, computer programming, and pretty much everything in between. Some people believe that doing any sort of analysis of a board game takes the fun out of it, but for me (and perhaps for you too), the analysis is the fun of it! Is there an absolute, “best” property/color group, and if so what is it? If not, then under what conditions are different groups best? Is it really best to buy every property you come across, or are some of them simply not worth it? Just how much of a factor is luck really? What sort of statistical edge can a knowledgeable player expect to gain over time? Can a friendly game of Monopoly actually go on forever? Can we use a simulator to help examine various theoretical — as well as actual — game scenarios? Will the results be conclusive enough, or will the variance overwhelm the analysis? Do you prefer a more interactive approach? Check out the O.M.S. (Online Monopoly Simulator) Forum! Whether you’re a fellow math nerd looking for precise calculations or you’re a dad/mom/son/daughter looking to settle a disagreement during a game at the dinner table, this blog is for you! ** Note: This website is non-commercial in nature, free to use, and intended solely for studying Monopoly strategy and related probability / mathematics. “HASBRO, PARKER BROTHERS, the MONOPOLY name and logo, the distinctive design of the game board, the four corner squares, the MR. MONOPOLY name and character, as well as each of the distinctive elements of the board and playing pieces are trademarks of Hasbro for its property trading game and game equipment. � 2012 Hasbro. All Rights Reserved. Used without Permission. If it is the first round of the game and i land on a chance which tells me advance to the nearest station, if unowned you may buy it, am i allowed to buy it? You are always allowed to buy properties that the bank owns. Going around the board once without buying properties is not an official rule. do you still actively work with the simulator? I just tried to register at pandora.dyndns.biz so I can use your Monopoly Simulator to improve my Monopoly skill but every time I press Register button it gives me error: “could not connect to socket”. Can you help me to solve this issue? Thank you in advance and thank you for awesome idea. So sorry about that; there have been some issues with my ISP. Mind trying again? If a player has two consecutive monopoly’s (i.e. all on one side of the board or even a corner of the board), is the probability of their opponent landing on one of their properties greater than if the player had two monopoly’s which were on opposite sides of the board? Hey Myles! Thanks for the question. It’s certainly terrifying staring at a long row of opposing houses and hotels, isn’t it? That said — and admittedly without going into too much math (for now) — I’m guessing that the added benefit of consecutive monopolies is not too significant in the long run. Stay tuned for a more technical response! I’d like to know where the monopoly man’s monocle went. Hi there, love that someone took the time to make this. I keep getting a 0% chance of winning for each player. Do you have any idea why? Here’s what I got http://imgur.com/a/CumWt Thanks! Hey there, Patrick! Thanks so much for the heads up. There was an issue with the server, which has now been fixed. I love the idea of an blog just about my favorite game – monopoly – and I’m glad that I found yours. Love to read it!! I just found you online. We have a new board game called HoudiniOpoly. I do have questions. We want this game to be unique in that all of the elements are based on historical facts about the legendary Houdini. We are working out the community chest (Houdini Challenge) Cards and the Chance (Pick A Card) Cards. One card says… Houdini was the first to make an elephant disappear. If you can vanish an elephant, Houdini’s bank will pay you $2,000. If you cannot, collect only $200. We are creating HoudiniOpoly. It’s all about Houdini. We have lots more questions as well. We designed it to take players through Houdini’s life with loads of fun facts. We also want to have Houdini Challenging players to win rewards. I’m trying to figure out if the game will still work the same if we change the bills by adding a zero to each denomination. We created a game called HoudiniOpoly and thought it might be more fun to change the money. We are hoping it works.